Isn't character progression the main reason for playing MMOs? Massively.com has an article explaining why Sci-Fi MMOs have not done well. And I disagree with almost all of it. Their failure has nothing to do with confusing names, or too many skills or a setting that isn't sufficiently well established in our collective race memory. Much like hit points, levels are such an established part of all the fantasy MMOs, that we can't imagine playing without them. At level 1 you are Joe Schmoe, dressed in dungarees and wielding a hoe. Kill a few pigs, maybe a wandering bandit or two and - bam - you're level 2 and can be taught to shout really loud. This lets you kill bigger pigs and tougher bandits and eventually you become so uber that you can flatten a rain forest by blowing your nose. Levels are great because character progression is the main motivation for playing MMOs. Levels have a secondary purpose of letting you learn the game gradually but the main reason they are there is to drip-feed cool new abilities as a reward for playing a lot. Even when you hit the level cap, levels are still there. In World of Warcraft you simply switch from character levels to gear levels as you try and collect a full set of Tier 7 armour so that you are mighty enough to survive the hunt for Tier 8. Central to the mechanic of character levels is the idea that player characters are heroes. You are not an ordinary mortal; you are a legend, with epic powers, the strength of a hundred men and a weapon forged in the brain of a slain god. Levels create a strange sort of stratification to society because the poor old non-player characters (NPCs) have to match their levels to yours, just to be able to look you in the eye without their face melting off. Marcella Bloom is a barmaid in the Hero's Welcome inn. She's level 75. Did she really fight her way through Azeroth, Outland and the frozen shores of Northrend and then get to Dalaran and think "I'm going to vendor my epics and serve beer from now on"? Or can you level up by grinding waitressing if you are a barmaid class? But we can mostly maintain our suspension of disbelief in a fantasy game because there of the magic and monsters. Magic and monsters let you explain nearly anything. Level 75 barmaid? She's magic. Pig with a million hit points? It's a monster. The common ancestor of all fantasy settings, Lord of the Rings, was itself structured as a linear levelling up quest with the main characters growing more powerful and acquiring magical weapons as they progressed through a landscape that grew steadily more dangerous to keep pace with them. You can't do that nearly so easily with Sci-Fi. Our shared cultural heritage of Sci-Fi stories generally involve heroes that triumph through bravery, quick wits and luck. Not by becoming stronger or tougher or gaining magic powers along the way. 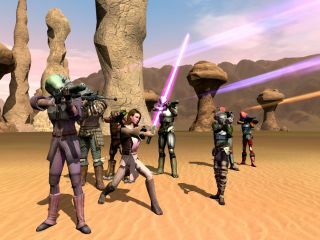 Star Wars has its Jedi, of course, but a world where all the players are Jedi feels wrong and if there are non-Jedi players, they have to be just as awesome to balance the game. But Jedi aren't supposed to be balanced so the immersion breaks down. A Sci-Fi MMO with levels doesn't work, for the same reason that a World War II MMO with levels wouldn't work. It's a different kind of story. We want our heroes in these settings to be tough, yes, but not tough to the point that we can no longer believe they are human. That just gets silly. Science fiction stories generally aren't just about collecting the Ancient Doodad of the Lost Empire of Yaddah Yaddah or defeating the Skeleton Lord of Wherever. They are about politics and treachery and exploration and figuring out alien technology. When you come up against a giant robot or a invading insect horde, you don't normally defeat it by being so awesome that you can go up against it mano a mano, you defeat it by being clever enough to figure out the weak spot and exploit that. Fantasy heroes are awesome because of their super-human personal attributes. Science Fiction heroes are awesome because they are lucky. What makes their actions heroic is precisely that they don't have magic powers or laser eyes and yet succeed despite that. That's a narrative arc that translates much better to a single-player game with lots of save-points, than to a persistent MMO. To make a Sci-Fi MMO work, someone needs to figure out a way to provide character progression that is as compelling as gaining levels and gear, without involving levels or gear. I really hope they succeed.